Attorney Francis M. Ciardi, Esq. Francis M. Ciardi, Esq. 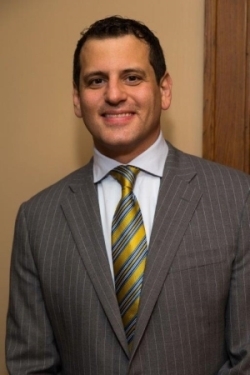 of the Law Offices of Frank Ciardi, Mr. Ciardi is a former member of the Monroe County District Attorney’s Office. During his time with the District Attorney’s Office he successfully handled more than 1,000 Driving While Intoxicated cases. Mr. Ciardi additionally served as a felony DWI prosecutor in charge of felony Driving While Intoxicated matters. Both as a prosecutor and a criminal defense attorney, he has tried over 100 cases to verdict, including serious felony criminal matters. His experience as a prosecutor has refined his trials skills and provided him with much insight. By knowing opposing counsel’s systems and strategies, Frank is able to anticipate future hurdles and concerns and uses this knowledge to better defend the rights of his clients. If you have been charged with a DUI, Frank Ciardi is an attorney you can trust! Mr. Ciardi is a graduate of Niagara University and the University at Buffalo School of Law. He is a member of the Monroe County Assigned Counsel Panel and is also a member of both the Monroe County and New York State Bar Associations. He coaches disadvantaged youth for Flower City Soccer. He is an active member of the Italian American Community Center and Italian American Sports Club. Mr. Ciardi is a life-long Rochester area resident where he lives with his wife and children. United States Federal District Court, District of New York. United States Ninth Circuit Court of Appeals. Monroe County Bar Associations; member 2000. New York Criminal Defense Lawyers Association.